Last month at Future of Mining 2018, PETRA Managing Director, Penny Stewart demonstrated the world’s first digital twin for mine value chain optimisation. Two years of historical data from PanAust’s Ban Houayxai mine was ingested into the MAXTA digital twin. But, before we jump into that story, you may be thinking, what is a digital twin? A digital twin can be thought of as a time machine. It enables us to look back in time to discover how we achieved our best performance. It also enables us to simulate the future by experimenting with ‘levers’. A digital twin enables us to pull ‘levers’ in a virtual environment to simulate options. A MAXTA machine learning digital twin enables rapid simulation of mine planning, blasting, metallurgy and process control options. Together, engineers and geologists evaluate options based on 10s of millions of tonnes of historical performance data. These options are easily communicated to managers using digital twin visualisation (see video below). Digital twin visualisation breaks down operational silos and enables multidisciplinary teams. MAXTA Case Study: Ban Houayxai Mine, Loas (abstract submitted to Complex Orebodies, 2018). “The Ban Houayxai Gold-Silver Operation is a producing asset for Australian-based copper and gold producer, PanAust Limited. The Operation lies within PanAust’s 2,600 square-kilometre Phu Bia Contract Area in northern Laos. Commencing production in 2012, Ban Houayxai is operated by PanAust’s Lao-registered Company, Phu Bia Mining. PanAust owns a 90 per cent interest in Phu Bia Mining. The Government of Laos owns the remaining 10 per cent. In 2018 a machine learning algorithm was installed at the Operation to predict future metallurgical characteristics based on previous process plant performance. The algorithm was enabled by the integration of two years of 3D geological with plant data to derive a formula that can be applied to block models, allowing both ‘backward’ reconciliation analysis and ‘forward’ predictions. Data from approximately 10 million tonnes of ore was integrated and analysed in 12 hour batches over a two-year period. Unlike conventional mine-to-mill studies based on samples and test work, or tracking batches of ore with markers, machine learning based value chain optimisation uses large amounts of historical data to predict future plant performance. Proprietary data integration software creates a digital twin of the value chain enabling machine learning algorithms to continuously ‘learn’ from the geology, and plant data to automatically update the prediction model ” – Machine learning at a gold-silver mine: a case study from the Ban Houayxai Gold-Silver Operation. Carpenter, J, Cowie, S., Stewart, P., Jones, E. and Offer, A., abstract submitted to Complex Orebodies 2018, Brisbane 2018. MAXTA data integration across the mine value chain. It may surprise those familiar with Mining Digital Road maps and Industry4.0 articles to learn digital twins weren’t pioneered by the manufacturing industry. In fact, NASA pioneered the digital twins concept in 2010 – NASA Modeling, Simulation, Information Technology & Processing Roadmap, 2010. In 2013, ‘digital twins’ are first mentioned in manufacturing’s Industry4.0 (Elisa, et al 2017). And, the EU’s MAYA advanced manufacturing project “focus (is) on dynamic simulation models” that exclude spatial “grid based data” simulation – EU MAYA Meta Data Model. In contrast, NASA cyber-physical systems (CPSMA) research program is about space and remote locations. MAXTA® was inspired by aeronatical engineering and NASA’s CPSMA research project. Like mining, both aviation and NASA are heavily reliant upon spatial data. Weather and climate wreaks havoc on aviation. Similarly, geological uncertainty adversely affects mining. Unfortunately, in December 2017, President Trump redirected NASA’s research efforts to the moon instead of Mars, and this resulted in the cancellation of the CPSMA project. MAXTA is the result of three years of intensive research and development into data integration across the mine value chain. In the first two years, PETRA’s Mining Magazine Award nominated PRODFINDER big data approach to mine-to-mill proved these integrations produce statistically significant prediction models (p value <0.05 and R2 adjusted between 0.25 – 0.6). 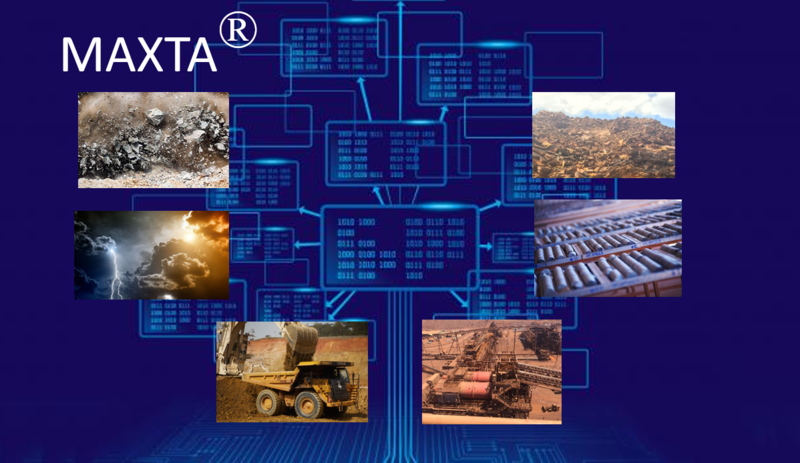 Over the past year, MAXTA® research and development has focused on machine learning algorithms for mine value chain optimisation and real-time deployment. It is worth mentioning that MAXTA real-time deployment will be simplified by the excellent interoperability projects undertaken by the Global Mining Guidelines Group. Future integration with software platforms e.g. Resolutions System’s MaxMine platform. Integrate MAXTA into company platform and systems.